Your Chobe safari in Botswana will take you through some of the most beautiful and ecologically diverse areas in Botswana. These different habitats are home to many species of animals. Chobe is made up of four distinctly different eco-systems, namely the Serondela area (otherwise known as the Chobe Riverfront), the Savuti Marsh, Linyanti Swamps and lastly the Nogatsaa and Tchinga areas.Chobe is made up of four distinctly different eco-systems, namely the Chobe Riverfront, the Savuti Marsh, Linyanti Swamps and lastly the Nogatsaa and Tchinga areas. The Chobe Riverfront is located in the North East of the park and is characterized by lush green plains and dense forests which attract large numbers of Elephant and Buffalo. 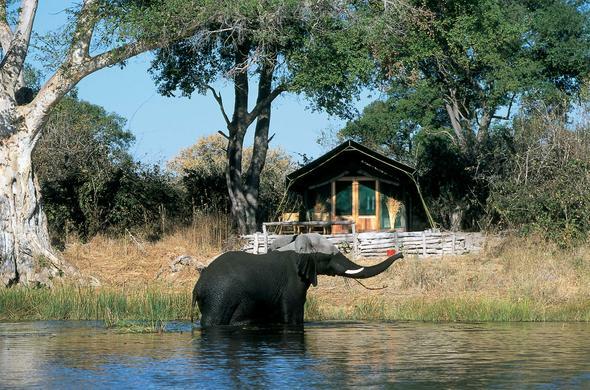 The Riverfront is the most visited part of the Chobe National Park as it is situated close to Victoria Falls. This region is known for the large herds of Elephants that gather around the areas of permanent water in the dry winter months. The Savuti Marsh is found in the West of Chobe National Park and is characterized by rich grasslands, savannah woodland and a large mixture of trees and vegetation. The Savuti Marsh area is well known for a number of popular wildlife documentaries which were shot in the area - namely the National Geographic films by Dereck and Beverly Joubert. The Savuti Channel splits the Chobe National Park and empties into the Savuti Marsh. The Linyanti wetlands are found in the western section of Chobe. The Linyanti River and marshes are complimented by the distinct dry woodlands. Linyanti's Wildlife Reserve is known for its predators and large concentrations of game, mainly Elephant and Buffalo which move down to the Linyanti River at the beginning of the winter months.The hot and dry hinterland areas of Nogatsaa and Tchinga are remote and inaccessible, and are mostly visited by the adventurous traveller. The hinterland area is particularly good for viewing Eland. The area has abundant surface water well into the dry season, and attracts an abundance of game between August and October.